Maison principale - salon ouvert - d'immenses fenêtres donnant sur une vaste pont principal, avec le maître salle de bains et dressing. Maison en pierre - 2 grandes chambres doubles avec salle de bains. Maison de pêcheur - autonome avec double chambre en suite avec terrasse, cuisine / salle à manger séparée (avec 2 lits simples) et donnant sur un balcon. La propriété convient à un couple pour une occasion spéciale (lune de miel?) ou des parties jusqu'à huit ayant de grands espaces privés ouverts. Notre directeur: Notre responsable local, qui parle un excellent anglais, sera là pour vous accueillir et vous emmener à la maison personnellement. Elle sera là pour vous aider à vous familiariser avec la maison et ses environs et de vous aider tout au long de votre séjour pour assurer un séjour inoubliable. Comment pouvons-nous aider? : De organiser des transferts en voiture privée à l'emprunt un téléphone mobile local, laissez-nous savoir comment nous pouvons vous aider et nous ferons de notre mieux pour répondre à toutes vos exigences. Restauration: La cuisine aura déjà été approvisionné avec quelques dispositions simples quand vous arrivez. Bien que conçu pour location un cuisinier peut être fourni pour les petits déjeuners ou pour un service de restauration complet si l'on préfère - se il vous plaît renseigner pour la disponibilité. Toutes les salles de bains sont nouvellement équipés et disposent de douches puissantes. We have just returned from Casa Tartaruga where we had the most amazing time - we could have happily stayed for ever. 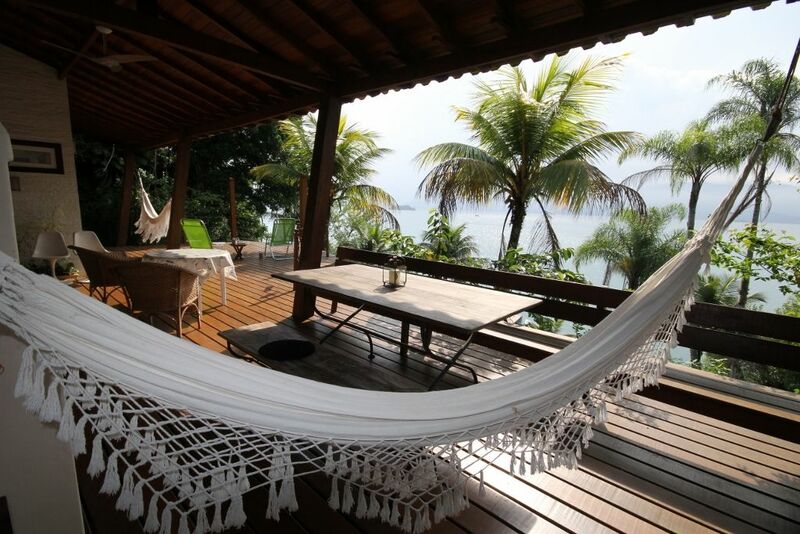 The setting is spectacular with Atlantic Rainforest behind and incredible sea views in front, only accessible by boat and with a virtually private beach a short walk or swim away. If you’re luck you will see turtles and dolphins swimming by in the bay. The owners have done a beautiful job and created a stunning, bright home surrounded by gardens landscaped with native plants. Yara, who lives in Parati and is the house manager, arranged transfers from Rio to the house, had all our groceries bought and delivered and generally made sure that everything ran smoothly. If you don’t speak Portuguese her help is invaluable. We also took advantage of the services of Sueli who came in every morning and made breakfast, cleaned, tidied and prepared lunch. She is happy to do as much or as little as you need. We had a fabulous time swimming in the sea off the dock, fishing, snorkelling, paddle boarding and kayaking and all the equipment is provided. We did two boat trips with Andrea on his boat Latitude (which Yara can arrange) and would highly recommend you do this too. Andrea took us to some beautiful deserted bays where we could swim and snorkel, and to a fantastic restaurant each day for lunch. If you want to pop into Parati just ask Yara to book Budgi, the local water taxi. We did this a few times for shopping and meals in town. All in all a wonderful place to spend some very relaxing time and really get away from it all. Thank you so much for the lovely review. We are really pleased you enjoyed your stay and were able to take advantage of all the area has to offer. We would love it if you and your family would like to come back soon? After a hectic and exhausting week at the Rio Olympics (which was most enjoyable), Casa Tataruga was just what the doctor ordered!! It was like being cast away on your own desert island away from modern life but with all the mod cons on hand. The whole experience was an adventure.....the peace and tranquility of where the house is situated, being able to connect with a world that normally doesn't exist in our everyday lives. Yara was fantastic in ensuring that our needs were catered for and ensured that our holiday was everything that we had hoped for. Some of the largest prawns I have ever seen would appear via Suelee who also prepared a mean creme caramel for us. Yara arranged for a trip to a mountain village where we just happened to stop off at a distillery at 1000 for some light refreshment, a lavender farm owned by an Englishman in the middle of nowhere, then on to various pottery studios and finally to a hidden restaurant where the owner prepared a delicious lunch in very tranquil setting. There is a secluded beach next door to the house with a school which is populated by a small group of young children who arrive in the morning by boat!!! We were also entertained one Sunday by a 5 a side soccer tournament on the beach. Casa Tartaruga lived up to its name when we saw a turtle languidly swimming by on more than one occasion. All in all it is a quiet, tranquil place - a sanctuary from the hustle and bustle of life. The weather was hot and it was such a pleasure to be able to drop into the sea to cool off. I didn't use the kayak or paddle ski because it would entail a level of effort that I didn't want to muster. Batteries were fully charged when I returned to the UK. Can't wait to go back there. We had a wonderful week at Casa Tartaruga after our daughter's wedding in Sao Paulo in May. It was the perfect place for our family and the bride to relax and recover after the celebrations. The house is lovely, peaceful and very well cared for. Yara manages it beautifully, was very helpful and was always available when needed and Sueli kept it spotlessly clean. We loved swimming from the jetty just below the house, BBQing fish on the veranda and had a happy time on boat trips and exploring along the coast path. Paraty is worth many visits and, as our visit was mid season, the town was very quiet. It is a beautiful place for a holiday away from a busy world. Do hope to return one day. We had an absolutely wonderful stay at Casa Tartaruga. It is truly paradise. The home is beautiful and located in a tranquil area with a small private beach just steps away. It far exceeded our expectations. It was perfect to accommodate my wife and myself along with our two friends who stayed in the Stonehouse. Everyone was able to have privacy while still enjoying each other’s company. A clear view of the bay can be seen from the living room and master bedroom and it was breathtaking to see the sunrise lighting up across the bay in the morning. Although being an eco house nothing was lacking. Yara made our arrival seamless. She was waiting for us at the pier in Paraty with a boat transfer and made sure our groceries were stocked and Sueli was on hand to cook a delicious meal. Yara was on hand whenever we needed and also arranged early departure from the home to ensure we returned to the airport in time for our flight home as well. There are many activities to do including hiking, swimming, fishing, snorkeling, kayaking, and paddle boarding the coast. It was relaxing just sitting out on the dock watching the boats passing by on the bay. We also enjoyed a short 20 min boat ride back to Paraty. The town is quaint and the shops are full of hidden treasures. It was nice to return to peace at the end of the day and more of Sueli’s cooking. Thank you Sue for such a well cared for property. We had an amazing time and look forward to returning soon. Thank you so much for taking the time to write such a lovely review. We are really pleased that you had a great and memorable stay and that Yara and Sueli were able to contribute to that. We look forward to welcoming you back in the not to distant future. act as translator and order anything you wish - transfers/local information/organise day trips. The bird life is wonderful, and marmosets and monkeys were seen in the gardens - very exciting. Old Parity itself, a short boat trip away, is colourful and atmospheric and well worth visiting. It was a wonderful experience and I would definitely go back to Casa Tataruga. La maison est située dans de vastes jardins privés qui mènent à Baré Beach (la maison à une petite communauté, amical) et surplombe la magnifique baie de Paraty. Nager ou poissons directement sur le quai privé ou de la plage abritée, marcher le long des sentiers côtiers ou louer un bateau pour ses plages idylliques et déguster fruits de mer superbes régionale ou simplement vous détendre sur les ponts et regarder le monde passer. La charmante ville coloniale portugaise de Paraty, une promenade en bateau courte distance, offre d'excellentes installations pour faire du shopping, des restaurants et autres excursions vers les îles, plages fantastiques, et des activités comme la pêche, la plongée et la randonnée. La ville accueille de nombreux festivals, y compris Jazz, de l'Alimentation et du cinéma, le plus connu étant le Festival littéraire international (FLIP), et bien sûr le carnaval annuel. Paraty se situe entre Sao Paulo (330 km) et Rio de Janeiro (236 km) sur le BR 101 avec de bonnes liaisons de transports publics et privés entre les deux (entre 4 et 6 heures de voyage). Il ya aussi un petit aéroport.